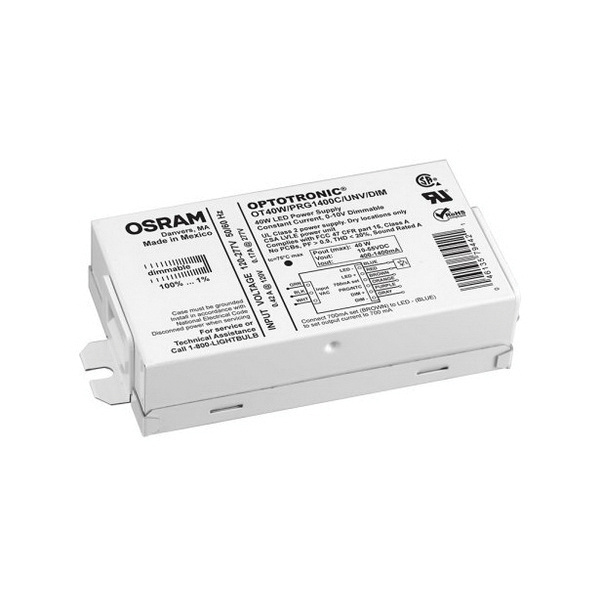 Osram Sylvania Optotronic® Constant current, OT40 series compact programmable LED driver consists of highly efficient, constant current 25 and 40-Watt LED power supplies. It is programmable with 1-Milli-Amp resolution to perfectly match LED load and maximize performance, programming does not require powering up or connecting the power supply to AC line voltage. The driver requires input voltage of 120 to 277-Volts AC and provides 10 to 55-Volt DC output voltage. It features built-in 0 to 10-Volt dimming that enables direct integration and operation with standard dimmers, sensors, as well as energy and light management systems. The driver is suited for downlights, in-grade fixtures, recessed troffer and wall washing. Compact programmable LED driver meets UL E320395 Class 2, CSA, cURus, RoHS and ANSI C62.41 Cat.A standards.